Quetzalcoatl is a Mesoamerican god whose name literally means “feathered serpent”. He was worshiped among all the major cultures of the Mesoamerican region through history. 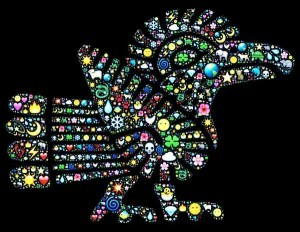 In art, he is represented by various animal symbols such as quetzals, rattlesnakes, crows, and macaws. Often he is also represented as spider monkeys, ducks, and other animals or beings of nature. His most prominent manifestation in art, however, is literally that of a serpent with a feathered head. There is also rich iconography, sculpture, and mythology associated with Quetzalcoatl among all the major cultures of Mesoamerica not just in history but also in the modern world. Quetzalcoatl has been worshiped by all the major Mesoamerican cultures including the Mayans and the Aztecs. The first documented worship of Quetzalcoatl is found in Theotihuacan during the first century BC or first century AD. This constitutes the Late Pre-Classic Period of the Mayan civilization. By the Late Classic Period (600AD-900AD), it appears that the worship of Quetzalcoatl had spread throughout the Mesoamerican region. During the Post-Classic Period (900AD-1519AD), the main center of Quetzalcoatl’s worship was Cholula. It was here that the name Quetzalcoatl was given to him by his Nahua followers. Aztec God Quetzalcoatl – According to one myth, Quetzalcoatl was born to a virgin called Chimalman to whom god Onteol appeared in a dream. The attributes of Quetzalcoatl varied in different cultures of Mesoamerica during different eras. Different versions of the birth of god are prevalent in Mesoamerican mythology. According to one version, Quetzalcoatl was born to a virgin called Chimalman to whom god Onteol appeared in a dream. According to another mythological account, he was conceived by the virgin Chimalman after she swallowed an emerald. Similarly, various other birth stories are also associated with Quetzalcoatl. In yet another version, Quetzalcoatl is said to be one of the four sons of Ometecuhtli and Omecihuatl. Each of these four sons presides over one of the four cardinal directions. Quetzalcoatl is closely associated with the myth of the four cardinal directions. According to this myth, the four sons of Ometecuhtli and Omecihuatl, one of them being Quetzalcoatl, represent the four cardinal directions. The south is represented by Huitzilopochtli who is the Blue Tezcatlipoca and the god of war. The west is represented by Quetzalcoatl who is also the White Tezcatlipoca and the god of light, justice, mercy, and wind. The east is represented by Xipe Totec who is the Red Tezcatlipoca and the god of gold and farming. Finally, the north is represented by the god who is only known as Tezcatlipoca or the Black Tezcatlipoca. 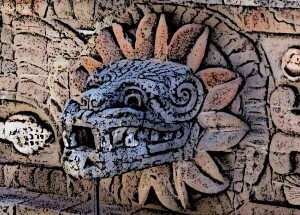 Mayans had deities with “feathered serpent” as their names. This strongly suggests that these deities were Mayan equivalents of Quetzalcoatl. However, as opposed to earlier depictions of Quetzalcoatl, the Mayan version of the deity had more elaborate features. At one hand, Mayans considered a snake as the embodiment of the cosmos. On the other hand, the snake was considered a vital instrument to help bring visions from the underworld to the Mayan kings. In the extant Mayan sources, it has been revealed that Quetzalcoatl, or the Feathered Serpent, was associated with warfare as well as fertility. Aztec Gods Quetzalcoatl Tezcatlipoca – Quetzalcoatl occupied a unique position in the Aztec pantheon and was considered one of the most important gods. Quetzalcoatl occupied a unique position in the Aztec pantheon and was considered one of the most important gods. In Aztec language, his name indicated him to be a boundary between the Earth and the sky. He was also associated with the creation of mankind, so he also possibly occupied the role of creator in the Aztec mythology. Quetzalcoatl was also linked with Aztec priesthood and one of the two high priests in the famous Templo Mayor of Tenochtitlan assumed the title of Quetzalcoatl. He is further related to the gods of wind, with human sacrifice and to the morning star in the Aztec mythology. In the 16th century, Spaniards conquered the Aztec Empire. Hernan Cortes, who led the Spaniards, was first invited into the city by Aztec Emperor Moctezuma II. Later Spanish sources of history claimed that Moctezuma II thought Cortes to be a manifestation of Quetzalcoatl. These sources further claimed that it was because of this superstition that Moctezuma II invited Cortes as a guest and didn’t harm him or his soldiers. However, independent historical sources do not substantiate this claim and later historians have disputed it as well. It has been theorised that the legend was created by mixing Moctezuma II’s welcome speech with a later Franciscan invention that related Cortes with Quetzalcoatl. According to Aztec mythology, Earth had been through four cycles of Sun, each of which resulted in the destruction of mankind. Of these, Quetzalcoatl was the Sun in the second cycle. However, at the end of the second cycle, mankind became like monkeys and so Quetzalcoatl blew up the whole of mankind. At the end of the fourth cycle, when mankind had perished again according to the mythology, Quetzalcoatl created a new people with his blood. These, then, are the people that still inhabit the world. 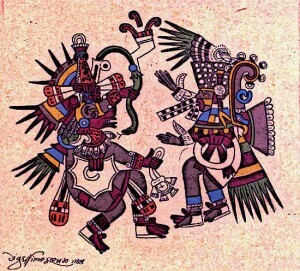 Based on this narrative, Quetzalcoatl is often cited as the Creator in the Aztec mythology. Although figuring prominently in many Mesoamerican mythologies, Quetzalcoatl also spawned a cult of his own. Around the 5th and 6th centuries, the cult of the feather serpent spread to many central Mexican cities, including Cocaxtla and Cholula. This is evident in the iconography recovered from these sites. The city of Cholula, in particular, was known for the importance it laid on the deity of the feathered serpent. The city was known as the center of Quetzalcoatl’s worship. Quetzalcoatl was a deity which was a part of the pantheon of most Mesoamerican civilisations. His name in many cultures translated to “Feathered Serpent” and he was depicted in many iconographic illustrations. Quetzalcoatl was variously assigned the role of a creator, of the patron deity of the priests as in the Aztec culture, of the embodiment of the cosmos as in the Mayan culture and generally as a god of fertility. He figures most prominently in the Aztec mythology but it was in the city of Cholula that the cult of Quetzalcoatl enjoyed influence and prominence during the Classic Period of Mesoamerica.